Carved from the ribcage of a whale, the Phantom is a fearsome sight to behold. Captain Dread Eye and his Skeleton Crew use a cursed heavy water ’membrane’ to hold their dreadnought together. With light-up ’heart beat’ feature and innovative hull membrane, this spectral warship will charge your child's imagination! The hull boasts three manual firing cannons that shoot skull projectiles. The rear of the ship serves as a dungeon for prisoners, and kids can ’feed’ figures into the trap door to see the Pyrate's energy power up the ship. 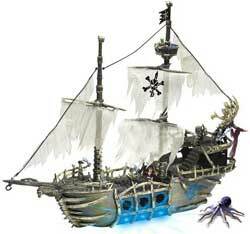 The set includes captain's chair, flip-out deck to reveal extra storage, real cloth sails, and attack and battle damage features including collapsing mast. 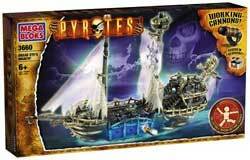 It comes with a complete Skeleton crew of 4 figures and 1 privateer and comprises 100 pieces.